Pelican 1460 Case 18.54" x 9.92" x 10.92" FREE SHIPPING! Home > Pelican > Equipment Bags > Police Equipment Bags > 1460 Case 18.54" x 9.92" x 10.92"
Pelican 1460 Case 18.54" x 9.92" x 10.92"
You need a tactical carrying case you can count on--one which will deliver on it's promise of security and durability! This Pelican tactical gear case promises these characteristics and more. Just as with many other Pelican mobile cases, this one guarantees plenty of interior space, with ways to better organize and separate gear. This one is extremely durable, don't believe that? It is 100% crush proof, airtight and fully water resistant--so your gear is not going to be damaged in any type of environment. This promises chemical resistance as well, so for EMS individuals, your gear stays sanitary and safe at all times. You also get that wonderful lifetime guarantee of excellence with this mobile tactical case, something that is definitely hard to beat! The stainless steel hardware not only provides added security, but these are also easy, throw open latches that allow a law enforcement officer, EMS worker or firemen to get access to what they need immediately! The solid wall design, once again, ensures security and stability--adding to the value of this tactical item. This is certainly one of the best gear cases available, and will offer years of satisfaction for the user! 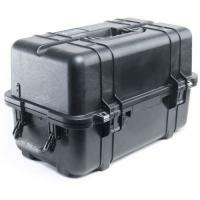 ©2002-2019 CopsPlus.com: Pelican 1460 Case 18.54" x 9.92" x 10.92" FREE SHIPPING!